How horrible is it that I really, really, am tempted to buy these?? 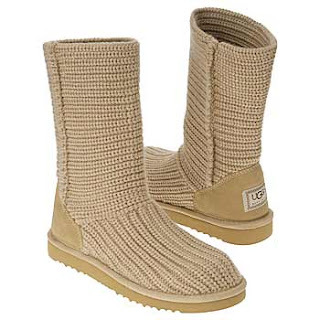 I was reading The Budget Fashionista and she was talking about the classic Uggs, and for some reason I remembered seeing this in the mall the other day and now I can't stop thinking about them!! I can list all of the reasons not to buy them (cost, they are really kindof ugly, I live in Texas where the odds of me wearing these are pretty slim...etc), but I just can't help myself. They just look so very cosy and everytime I see them I just think about how snuggly they would be around the house during the few months that I would actually get to wear them. Speaking of, how would you even wear these? Would you wear them jeans out or jeans in? And would jeans in require skinny jeans (because sorry, those are never passing my closet door)? So much to think about. I'll let you know if I give in to my depraved nature or not, but until then what do you think? Major "Fashion Don't"? Or "You could pull it off, Unsinkable, because you are just that fly" (And yes, I just described myself as Fly, don't ruin it by laughing at me please). Don't do it! It's fashion suicide!! I think that they are really cute on a very cold day. I am actually thinking about purchasing a pair for when I go to NYC this winter. It was so cold last year and I was so jealous all the girls with toasty toes. Because I am pretty short I am thinking of getting a pair with a wedge heel. They are totally cute. Go for it! Not fashion suicide.